[Jesus said to the disciples,] "I am not saying these things to all of you; I know the ones I have chosen. But this fulfills the Scripture that says, 'The one who eats my food has turned against me.' I tell you this beforehand, so that when it happens you will believe that I am the Messiah." Nothing hurts quite like someone you love betraying you. Jesus knows what is going on with Judas. He also knows that the rest of the twelve will turn away from him for at least a little while. He knows he is going to die a horrible and humiliating death. 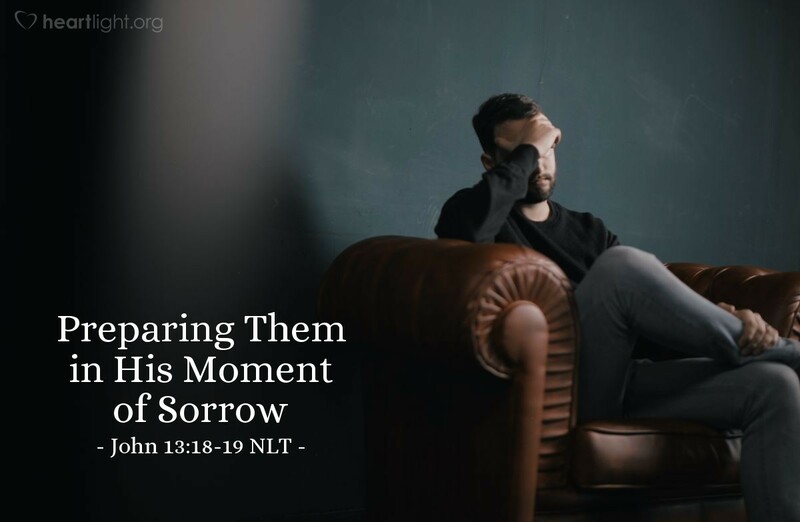 Yet in the middle of all of this betrayal, Jesus works to prepare his disciples and give them seeds of faith that will germinate after the horrors of the next few days are past. This example is indeed a powerful one for us when we face our ending days. How can we prepare those we love for our absence? How can we soften the blow to them? How can we help them have faith after we are gone? These thoughts shouldn't be ours only before our impending death; rather, they should be the questions which guide our daily lives before those we love! God of grace and mercy, give me the courage to live my life in ways that will inspire those I love to believe now as well as after I am gone from them. Use my life to sow the seeds of lasting faith in the hearts of those I love. Especially, dear Father, please help me reach ... with your grace. In Jesus' name, I pray. Amen.